My parents are visiting this weekend. After a week of marking marathons and cooking mishaps I wanted tonight’s dinner to be stress-free and undoubtably delicious. Though the following shepherd’s pie requires two nights preparation, neither part takes much effort and the results are amazing. If you don’t believe me ask Gen and Keith. Two years ago I made this for a hogmany party. There was plenty left after dinner but by the morning it had all vanished. It seems Gen and Keith (the munchers) had got out of bed several times during the night to feast on the leftovers. Rub the lamb with oil and seasoning. Cut small slits into the fat and stuff sprigs of rosemary into them as far as they’ll go. Lay out all of the vegetables (including the garlic cloves) and the herbs in a deep roasting tin. 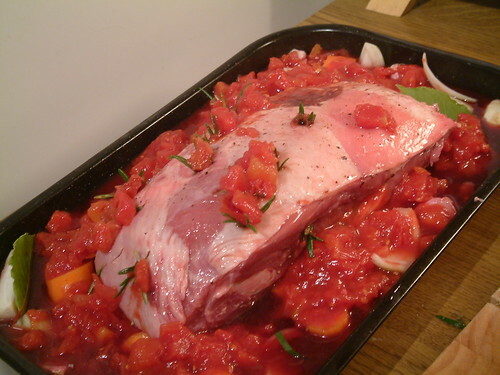 Place the lamb shoulder on top. Pour over the tomatoes and the wine. Cover the roasting tin tightly with a double layer of tinfoil. Place in the oven and cook for 4 hours. Remove tray from oven and leave to cool slightly before removing as much fat as possible from the lamb shoulder and shredding the meltingly tender meat. Add the meat to the vegetables (removing any twiggy bits of herb) . Cool and refridgerate. Boil the potatoes in well salted water until tender. Drain. Mash. Add milk/creme fraiche, butter and seasoning to taste. Add the meat/vegetable mixture to the bottom of a large heat proof dish or two smaller ones. Pour over the tomato juice and stir. Top with mashed potatoes. Use a fork to smooth the potatoes and make ridges on the surface. Brush with beaten egg. Cook in a 180oC preheated oven for 45 mins or until heated through and bubbling at the edges. Wendy! WOw! This is the most superior pie I have seen!!!!!! That Jamie’s a wealth of great recipes, I tell ya. The sight of your pie makes me suddenly long for a wee bit of lamb…anyhoo. You must be feeling better about your culinary skills now. A week of disasters often leads me back to favourite, trusted recipes. I’m so glad that this has broken your unlucky streak. It sounds wonderful. I love lamb, and this looks like a way to cook it that ECG will really enjoy too. Hey, it’s the weekend! Have a nice one. Oh, that looks good! The potatoes look perfectly crisped! This certainly is superior! If someone presented me with that I’d be weak at the knees. Lucy – There was silence as everyone ate last night. A good sign, I think. Pam – The crispy bits are the best – there was a fight for corner pieces! Truffle – 🙂 It fills the house with a gorgeous smell too. By the time it reaches the table everyone is ravenous! WOW, is right! I’ve always thought of it as a way to use up leftovers. I sit corrected! This is truly a superior pie! I hope they were all properly appreciative! You “outdid” yourself on this one Wendy, oh my! And serving it with a glass of red wine, very nice. What wine did you serve? I am sure all was consumed at the table! Katie – They were indeed. The leftovers had vanished before lunch the next day! That looks delish. Forgot what the French and the rest of the world say about English food. When somebody serves up an English dish like this, I think it could beat any “steak et frites”. Excellent! I love a good shepherd’s pie! 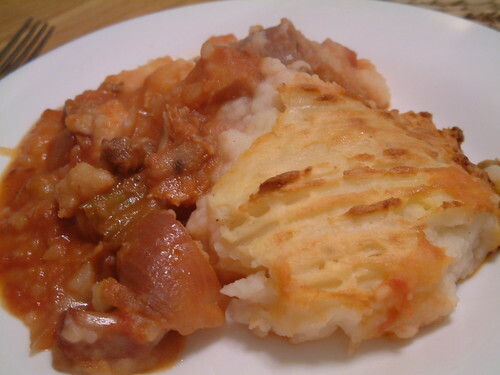 Actually, shepherd’s pie was the first pie I ever made! I will try this one, too! I love the idea of using the whole leg of lamb. Thanks for the recipe. I’m inspired! Rkhooks – Totally agree. There’s a lot of crap food in the UK but the vast majority of the traditional dishes (done well) are great. Maninas – It’s shoulder rather than leg that I use. It’s juicier and cheaper! Yup, this does sound superior, perhaps more than even just slightly. It has entered on the list and I’m sure it will be made soon. Wendy? What is a hogmany party? Wendy ~ How marvellous you are. What a smashing looking Shepherd’s Pie. I love the photo of the lamb shoulder. Yummy. Wish I was invited! Sadly, Eric doesn’t enjoy lamb, says it’s too gamy, but at least over the years I’ve encouraged him away from categorically refusing it. I’m sure your pie would tempt him into the “lamb’s not too bad” camp. Annemarie – I wanted to say “infinitely superior” but thought that was taking things too far! Shaun – My D isn’t a lamb man either but he adores this dish. Might be worth a try! Very nice. I think that shoulder is the best cut for shepherd’s pie, too. I’ve made something similar, but without the tomatoes. After removing the meat I roasted the bones and make a brown stock, then use that in the sauce of the pie, with a little white wine so there’s some acid in there. Of course, this makes it a three-step pie requiring even more sessions: evening, morning, evening. Helen – Those beads are so amazingly beautiful. Feeling the need to treat myself but it is sooooo the wrong time of year to be spending money on me! I’m tempted too, but my hubby would never get the hint. Helen – Will try it but I’m not holding out much hope!! Ah. This explains why the local farm keeps running out of shoulder of lamb suddenly. James – 🙂 Not sure I can take all the blame!